I know, I know, FINALLY! This blog post is about 6 months overdue, but it's finally here and I'm so excited to share. Jules and Kourt had seen the Hearth & Hand Magnolia dollhouse on tv during Target's Christmas commercials. They would scream every time they saw it and would repeatedly tell me that they wanted Santa to bring them that house for Christmas. Then Jules sat on Santa's lap at the mall and told him she wanted that house but wanted his elves to paint the door "a very light pinky color." I loved it! I loved her little and as usual, my mind ran with that pink door. I knew I wanted my girls to have her very own special house custom made just for them, so the madness began. 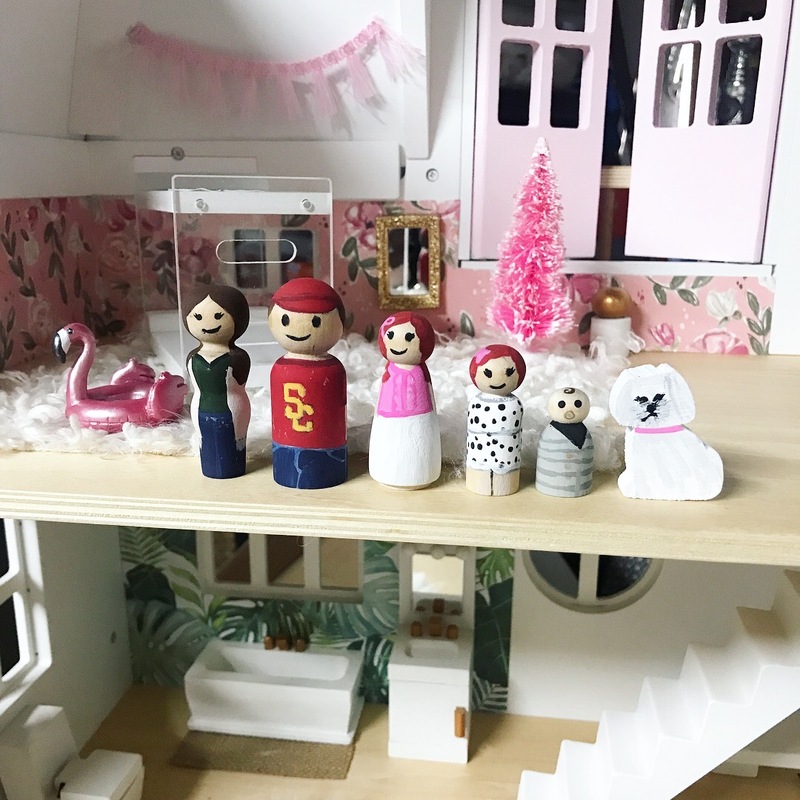 I searched for the cutest doll house furniture and got lucky with The Land of Nods set (now Crate and Kids). I fell in love with those bunk beds and that pink couch! I wish I could link it here for you but it's been sold out since December. They do have their Brownstone set though that would be super adorable in this house. I also fell in love with their decor kit but missed it, I had it in my cart for a week and when I went to order it was sold out. I still kick myself over that because I needed that gold pouf and that hanging plant! Since I missed the decor kit and couldn't find anything I really liked I decided to go full on crazy and make things myself with items from Michael's. I started with the walls which was just paper that I attached with double sided tape. I used an x-acto knife to cut out the windows. All the little accessories like the pots, the mini brass pots and pans, the chalkboard and gold mirrors are from the miniature section. They have so many cute things that are the perfect size for this house. The flamingo head was a floaty like the swan float that is in the bathroom, I just cut it off and attached it with foam stickers. The floats and the pink bike were from the seasonal section, where they had all the fairy garden houses and terrarium vases. There were so many girly pieces there that I still want to add to the house, like some wooden backyard chairs and a swing. The big mirror in the bedroom I made using a frame and shiny paper form the scrapbooking section. The carpets just might be my favorite things. They are all from the arts and crafts section where the feathers, felt and beads are. 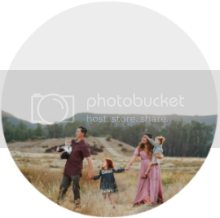 Super easy and add so much fun. The house numbers are stickers, that represent their birthday months November and September. I used those same stickers to spell out Jacks in the nursery. 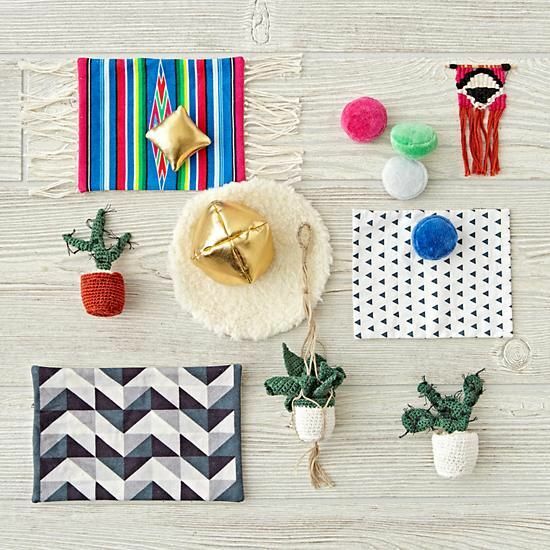 The hello mat is a gift tag I had from target. Painting the doors was super easy but I made the mistake of using a brush on the first coat. I hated the streaks it left so ended up using sponge brushes which worked perfectly. I also made the mistake of painting the doors after my husband assembled the house. It was a huge pain to paint them, they moved so much and taping everything around them was no fun. So if you're going to do something similar definitely paint before assembling. I also painted little wooden dolls, one for each of our family. I loved the way they turned out but ended up taking them from the girls because Kourtney was chewing on them. 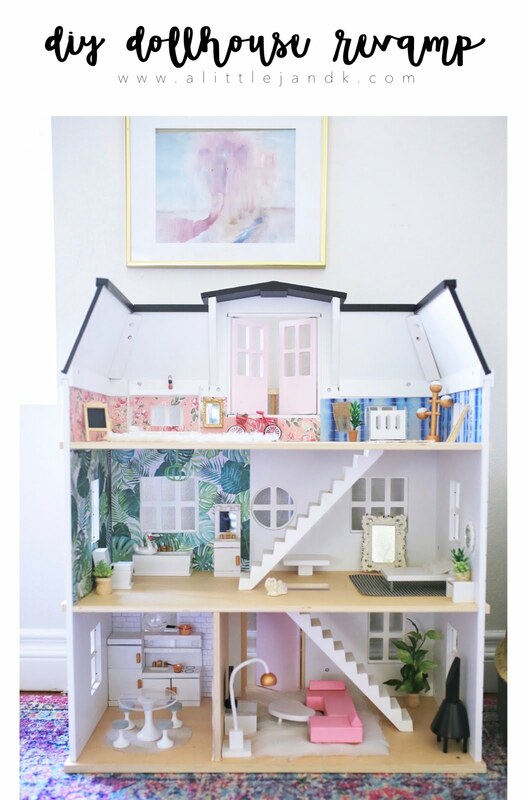 The doll house ended up turning into an L.O.L doll house. They fit perfectly in here and look so cute! The house gets so much love! We all love it (it's the dollhouse I have always dreamed of) and I end up playing with the girls every time we turn it around. These kinda gifts are the best. I see lots and lots of fun dollhouse years, not only with my girls but hopefully with their girls one day. If you have any questions feel free to ask them below. I love this! I wanted the house right after I found out I was having a girl because it’s such a timeless piece I want to have it on hand to give her. It sold out so quickly!! I’m thrilled to have been able to order it from your post. So precious!! !